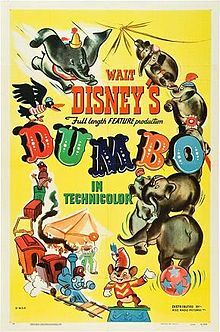 "Dumbo" (1941) is one of the classics of Walt Disney Productions. 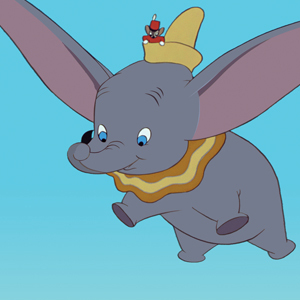 The big-eared elephant helped save Walt Disney Productions and has remained a fan favorite ever since. Have you ever heard the phrase "see pink elephants?" It comes from "Dumbo." 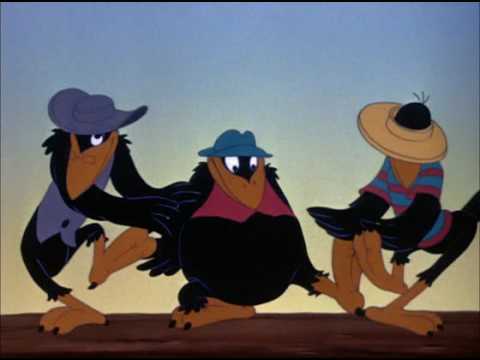 Few films from the time have resonated as well as this one, and there continue to be calls for a sequel, such as was done for the previous year's "Fantasia" with "Fantasia 2000" (1999). 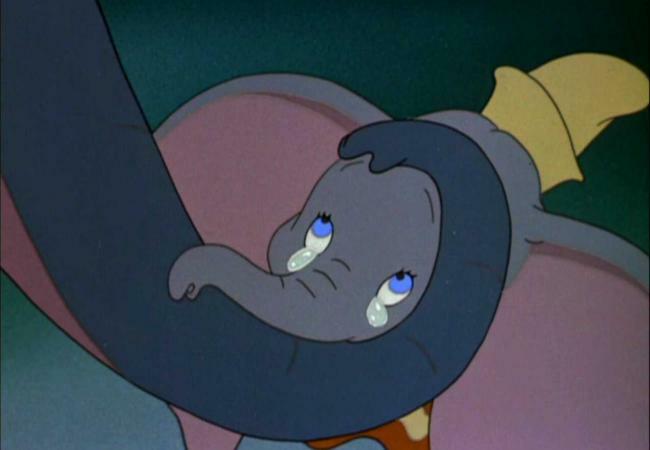 Everybody can relate to Dumbo, whose very name shows how poorly he was treated but who rose above the taunts to become a star. Mrs. Jumbo (Verna Felton) is traveling between gigs on the train Casey Jr. (Margaret Wright) and receives a baby from a stork (Sterling Holloway). It is a wonderful baby elephant, but everyone quickly notices that it has big ears. They nickname him "Dumbo" and the name sticks. His mother gets angry, but when she defends her son, she is separated from the other animals for fear she is a danger to them. Aww, a baby elephant, how cute! Dumbo is alone, but then he gets a friend from an unexpected source: Timothy Q. Mouse (Edward Brophy). After a circus stunt goes wrong because Dumbo's ears get in the way, the strict Ringmaster (Herman Bing) makes him play a clown that falls in a vat of pie filling. Dumbo hates this, so the mouse tries to cheer him up by taking him to see his mother. On the way back, they innocently drink from a bucket that actually has champagne in it. The pair becomes drunk and sees pink elephants. He's so cute.. OH MY GOD! When they wake up the next morning, they are high in a tree. The only way they could have gotten there is if Dumbo flew them there using his ears. 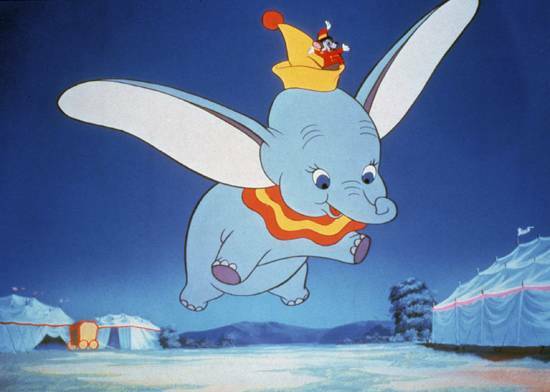 With the help of some encouraging crows (Cliff Edwards and others), Dumbo learns to fly by using a "magic feather." Timothy Q. 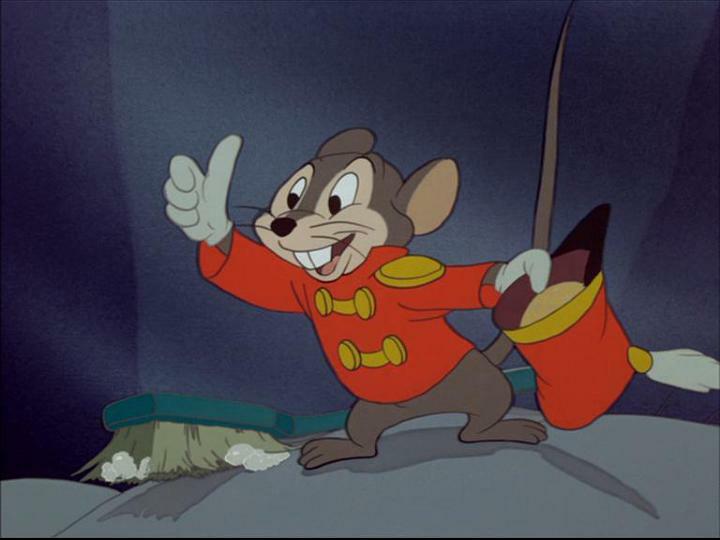 Mouse at your service! Later, Dumbo is in the middle of his act, which involves jumping from a building into the vat of pie filling. He loses the feather, but the mouse tells him he can do it without any feathers or magic. Dumbo then decides to fly around the arena to test his new-found abilities in front of the crowd. Everyone loves Dumbo now, and he and his mother receive star treatment. It is a simple tale told quickly, in barely an hour, but a lot of raw emotion is crammed into that hour. Watch as Dumbo's mother is thrown into circus jail for trying to protect her son, then Dumbo seeks her out just so he can touch her, which is shown as a basic need by all animals by showing others doing it, too. It is very powerful stuff, a perfect marriage of music and animation. Amazingly for a Disney title character, Dumbo himself has no dialog whatsoever in the entire film, but he communicates just fine. 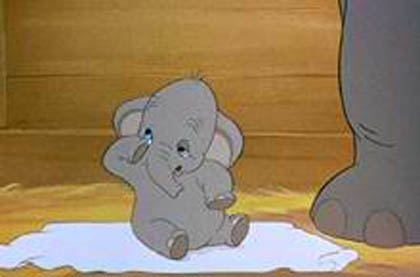 The song where Dumbo finds his mama, "Baby Mine" by Betty Noyes, was a big hit and was nominated for the Academy Award for best song. The film did win the Oscar for Original Music Score by Frank Churchill and Oliver Wallace. It accompanies one of the gentlest sequences in any Disney movie and may make you cry, just as it does character Timothy Q. Mouse. "Dumbo" has striking similarities to the classic "Rudolph the Red Nosed Reindeer," the tale of a reindeer ostracized for his big nose who turns into a hero because of that nose on Christmas Eve. That special came out in 1964, so you might think that it borrowed from "Dumbo," but the song on which that special was based actually was first recorded in 1949. You might think that "Rudolph" still was borrowing from "Dumbo," but the song came from a 1939 book written by the composer's (Johnny Marks) brother-in-low, Robert L. May. So, Rudolph came before "Dumbo." Hi, fellas. Find any good carrion lately? 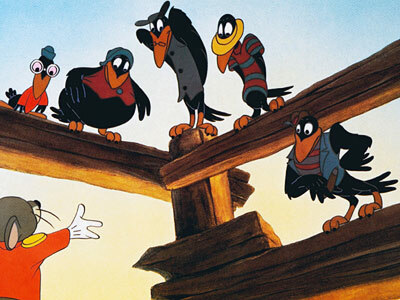 The production was troubled because of attempts to unionize the Disney animation studio. Walt Disney hated unions, feeling they were all part of a Communist plot. There even was a strike by the animators right in the middle of production. Disney got his revenge by putting in the clowns who "hit the big boss for a raise" in "Dumbo." Don't mess around with Walt Disney! This was originally intended as a short film, but Disney liked what he saw so much that he expanded it into a feature. It still turned out to be Disney's shortest feature ever. Much like Dumbo himself, the film was derided for its length by the distributor, RKO, who ultimately had to distribute it anyway. Against all the odds, the film turned into a huge financial success, one of the few during the studio's early days. I wonder where they got the idea for "Thomas the Tank Engine?" Hmmm. The animation is very simple, almost sparse. Disney wanted to keep costs down, so he told his supervisor (there also were six other directors) Ben Sharpsteen to avoid going overboard with the backgrounds. 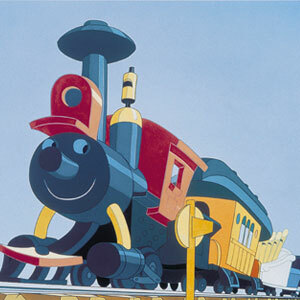 A lot of techniques used for much cheaper Disney cartoons were used, including watercolor backgrounds. 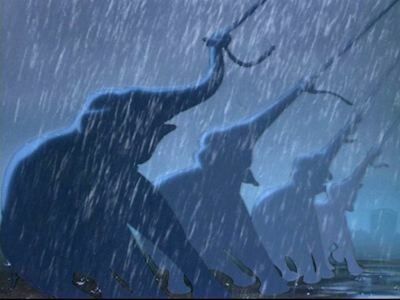 Without having to be worried about detail (like hand-drawing 2 million individual water bubbles, as in "The Little Mermaid"), the animators were free to refine the main characters. Bill Tytla animated Dumbo, one of the great jobs in animation history. 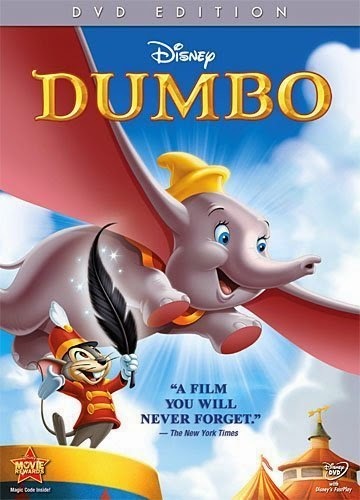 "Dumbo" was re-released on DVD and Blu-ray as recently as September 20, 2011 for its 70th Anniversary. It is available in Blu-ray and a plain DVD. You also may download it. Several interesting features are included about the making of the film, as well as games and short films. 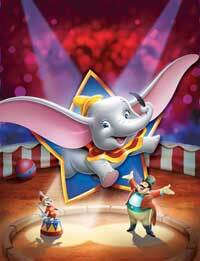 If you like Dumbo, the two-disc Blu-Ray/DVD combo is the way to go. Dumbo is still very much around. He is a popular ride at Disney's theme parks, and he starred in a live-action television series, "Dumbo's Circus," in the 1980s. Several picture books for children have been published about him, such as "Walt Disney's Dumbo: Happy to Help" (2001). 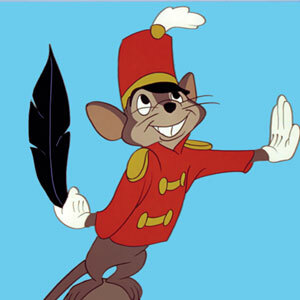 He even makes cameo appearances or is referenced in other films, such as "The Great Mouse Detective," "Who Framed Roger Rabbit" and "1941." There has been talk for years of a sequel, but the current management at Disney isn't interested in sequels to Disney classics right now. The story has a terrific theme for kids. 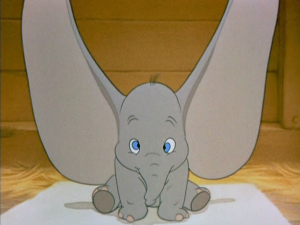 How can you not like Dumbo? The only reason it isn't as popular as "Rudolph the Red Nosed Reindeer" is because it isn't a holiday story. It has the same uplifting themes of overcoming adversity, learning to believe in yourself, embracing our diversity and learning to trust your friends. Better than all that, it is funny and a delight! This is one you won't mind watching, and kids will like it even more. View the "Dumbo" trailer immediately below. Despicable Me (2010) - 3D Gru Goodness! A Charlie Brown Christmas (1965) - A Good Man!